We can accommodate ceremonies & receptions up to 300 guests. Our venue fee varies by date, size, and need of the wedding. 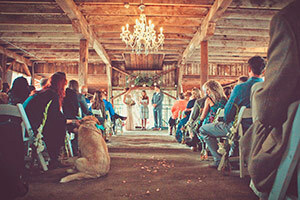 We specialize in fully staffed weddings, but can always make the wedding fit the couple's needs. This can range from, a small wedding of 40-60 guests on a Sunday for $1,500 to a larger wedding of 300 guests on a Saturday, peak season, with a day of coordinator, bartenders, a five person staff and ALL of our lodging and camping for two days for up to $8,500! We welcome outside caterers, we do have a list of our favorite vendors that we love to work with if a bride is looking for recommendations. If needed, we will proved it at no charge. The curfew for barn use is midnight, however if you choose to lodge with us the party can move to the farm house for which there is no closing time until you check out the next day at 11am. Yes, we can accommodate up to 250 vehicles. We have professional grade PA systems at our reception site as well as the ceremony site. We have a large 1920's farm house with 6 private bedrooms that can sleep up to 16. The carriage house is a one bedroom apartment overlooking the entire farm and is perfect for a honeymoon suite. Multiple glamping sites with beds and fresh linens, can sleep up to 12, as well as space for up to 30 tents or RV's. We manage all of the details of your wedding for you! The property owners will be your day of coordinator and facilities operator to do any small installations (drapes, boards, etc). Our parking attendants greet your guests, hand out your programs and offer to handle their gifts for them. They also act as a guide, not just so your guests don't inadvertently block people in with their cars, but they let them know the flow of where they are going and the best part, they keep late arrivals from interrupting the ceremony during very important moments. Our "A Crew" staff and bartenders help you set out all your decor, linens, alcohol, cupcakes, flower arrangements, tables, chairs at the ceremony site and reception, keep buffets and dining room clean and managed. We also choreograph and manage the timing of your walk down the isle and seating of key people. We do all your introductions to your reception, first dance, cutting of cake, etc, if you don’t have a DJ that will. We also package up all of your food, decor, flowers, left over alcohol, and set up your honeymoon suite if you decide to lodge with us! Curfew is midnight! If you lodge with us, you don’t have to pick up from the reception until check out the next day!